Happy Father’s Day from all of us at The Hackers Paradise and to ring in this upcoming day for Dad, we have partnered up with Bushnell Golf to give away some items. Let’s face it, fathers are playing golf and here at THP we want them to play better. 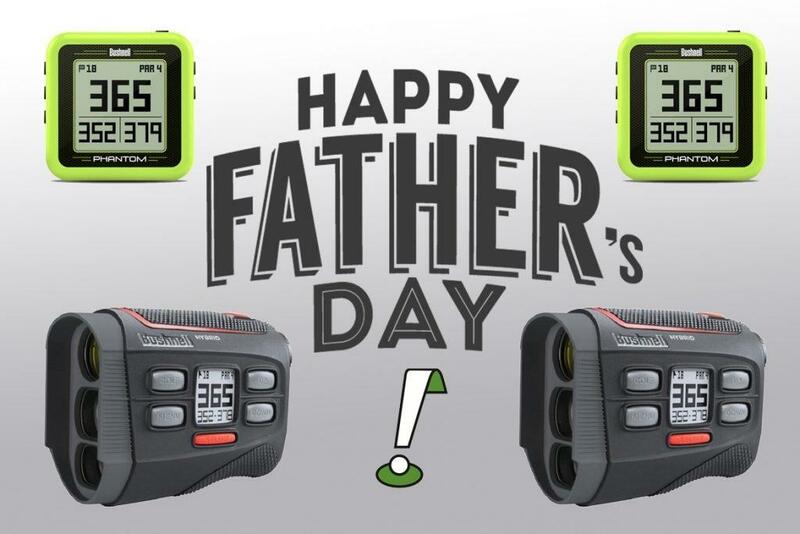 What better way than knowing your distances with laser range finders and GPS units and the winners will be announced the day after Father’s Day. Earlier this year, Bushnell launched a number of new devices to help you get your distances quickly and efficiently. For Father’s Day, THP is going to give away FOUR of them and entering is super easy. Starting things off with the Hybrid. Rather than lay out the specs, here is a quick segment all about the device. Sometimes, a heavy in technology device is too much for your Dad, so what is easier than the new Phantom GPS. Super magnetic clip, works perfectly with most golf carts and what is better than just glancing up and immediately knowing your distance necessary? Here is a quick 360 degree look at the Phantom. Entering is really easy. Watch the videos above. Then in the comments below, tell us, based on the information in the THP TV video, why you think the device(s) is right for Father’s Day. Do not forget to include your THP Forum Screen Name in the comments with your entry if you want it count. Subscribe now to THP TV so you never miss a new video, contest and more. Winners will be announced on the THP Forum on Monday, the day after Father’s Day. Both devices are right for Father’s Day because what father does not love new gadgets to play around with and ultilize on the course. Both take a lot of guesswork out of this already hard game and are made by one of the leaders in device measurement technology so the quality and technology will be coveted by any father that is lucky enough to receive one. What dad couldn’t use help with directions and in this case, to the hole. Being able to take a quick glance with either product is awesome or being able to get exact pin location distances with the Bushnell Hybrid is sweet. Can’t lie, I would love to have either of these devices. I think the Phantom GPS is right for dad. Why? Because dad can clip it to something if he’s riding and his bag if he’s walking. Why didn’t I pick the hybrid? Well, because plenty of dads might be better of aiming for the middle of the green, rather than the flag. Here’s to you mr. pin seeking dad. Slope and GPS in one unit! Wow! GenErr – Both units look fantastic. The hybrid is loaded with features that are probably beyond my golf capabilities, as I’m normally content with middle of the green distances. The Phantom is close to the Bushnell I currently use. Either one would make a GREAT father’s day gift. Neill1123 having slope and green with instant read of distance from gps is great for any dad,making it easy for them to use! I think this tool would be a useful device for the simple fact of ease of use. I had a couple of shots I had in yesterday’s round that I would have really liked to have known the distance. Not that it would have made a huge difference, However just knowing the exact yardage would be really nice. Being a Dad means keeping GPS coordinates on our kids that are essentially the hybrid versions of ourselves and significant others. So what could be more perfect than a hybrid version of a GPS and rangefinder to celebrate being a father on the golf course!? Have a few yr old GPS device today and looking to move to laser…BUT having both GPS and laser is a huge deal. Great stuff from Bushnell!. Thanks for opportunity, and happy father’s day gents! Slope and GPS with front, middle, back distances! Great tool to improve any Father’s golf game. First of all I trust Vrska. The fact that it’s lightweight is underrated, and having the ability to get F/B along with the pin all in one screen is amazing. Having slope is just a must anymore with range finders, but the little details like GPS with front middle and back, a laser finder to get exact yardage, its lightweight, its compact, it easily clips to your bag. What an amazing device. Laser Rangefinder and GPS together is genius! I use a GPS for my yardages to front and back and hazards, but then I also have a rangefinder for the exact yardage to the flag. I love the idea of both features in one unit! The Hybrid sounds perfect. GPS for front and back distances and a laser for exact numbers. Dad likes a quick look since he gets paralyzed with too much information on the golf course like I do. Both devices are great. The hybrid laser to get your exact distance and the compact phantom when you want to go a little lighter. Awesome tech by Bushnell! This dad would love to get his hands on a bushnell hybrid. Lightweight for walking is a plus for me. Also there are several times a round where I can’t get a yardage with my laser because of linenof sight issues. Every Dad needs a little help, and at this stage in my golf game, one of the most important things I am working on is course management. It’s impossible to do that unless you know where you are, and how far you have to go! Dad’s home course has a lot of elevated greens and tee boxes and the slope function combined with the GPS front and back would be so helpful. I really think something like this could be a huge game changer, I am really impressed with the design and what it could do for a person’s game. Slop, GPS, Light weight, and Laser! What dad wouldn’t love one of these? Both of these devices are awesome to just take a quick glance at and not have to worry about pinging something but I love the hybrid because it’s always nice to be able to tag a tree or a bunker and get a carry distance. I know my dad is always debating whether to wear his GPS watch or pull out the range finder and having both of them together would be the perfect all-in-one tool. Either one would be a great gift for my father in law. He is the one I credit for really getting me into golf. He added me to his regular foursome and made sure I got out every weekend so that I could gain confidence and skill. He has never owned a GPS or range finder and I think this would be perfect for him. I’d love to give it to him. Any gift given on Fathers day is a great gesture by the giver, my son is always wondering what to give me especially golf items. I am a tough one to buy for. But him just being around and giving a hug is enough for me. The reason for me this device would be perfect is the dual technology. The integration of GPS and pin seeking accuracy. I really like to get more spot on with pin seeking using a scope, but I have a shaking issue at times and trying to target is difficult at times, so having a GPS right there giving you the yardage would be a bonus at those bad times. I use GPS mostly with my yardages and play with scopes every so often. Thanks Bushnell Golf and Always THP! A Father’s day GPS is a long way from the old standby bottle of Old Spice. Dad doesn’t play as much as he used to and my game is doesn’t take the score card route to a green, a distance measuring device is a must have to make it through any round. Father’s day is about spending time and having fun, anything that makes the “see you at the green” a bit quicker makes for a better day. I’m interested in the Hybrid Unit. Sometimes I don’t want to have to shoot the flag because it’s a “sucker” pin. Having the ability to quickly see F, M , and B would make it easier and quicker to choose a club. Good luck to everyone and Happy Father’s Day to all the great dads out there!!!! I guess it would help to include my THP screenname, SanDiegoNative! Any father that plays golf would love either device. It is amazing how much technology they can pack into such a small and lightweight device. I personally like the hybrid GPS/Laser Rangefinder the best. And I’ve read a review of the Phantom, which was really positive, especially for such a tiny device that one can just clip onto the bag or golf cart. One of the thing she that caught my eye immediately is who listen weight they are said to be. I walk and extra weight Is not a friend. Additionally with the hybrid device it wouldn’t be nice to just be able to look down and quickly get a yardage when I’m laying up or not wanting to take on a pin just get it to the center of the green, but also be able to get that exact yardage to a pin that is in the go zone. Additionally the precision of the laser wouldn’t be great when practicing to dial in distances. As far as the phantom, played with guy who had one and what a great little device that is fast and accurate.